Not to be outdone by its rival gaming company, Sony announced today that they will be releasing two PlayStation 4 bundles for the upcoming Black Friday, both including two brand new games, and both priced at $399.99. 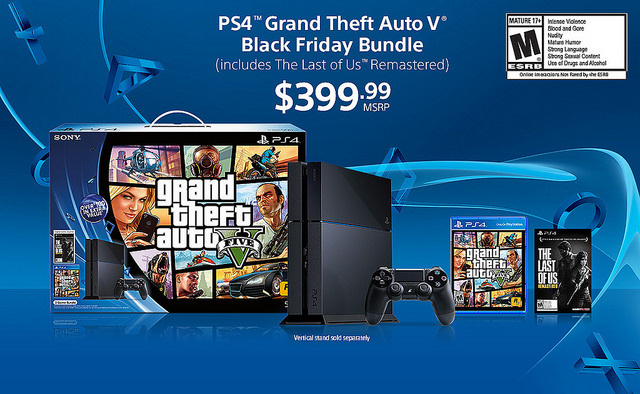 In the first bundle, and my personal favorite, is the Grand Theft Auto V Bundle, and it comes with a 500GB PlayStation 4, a copy of GTA V, and a digital voucher for The Last of Us Remastered. If you somehow missed out on one or both of those games, this is probably the perfect time for you to climb out from the rock you’ve been under and play them. The second bundle may not have two huge AAA titles, but does come with two of the most fun options the system have. For $399.99, you get LEGO Batman 3: Beyond Gotham, and LittleBigPlanet 3, along with the 500GB PlayStation 4. Gamers without a next generation console and looking to join the party can try and get their hands on either of the bundles, both coming with two games each, at select retailers starting Black Friday (or Thanksgiving, if you’re insane).